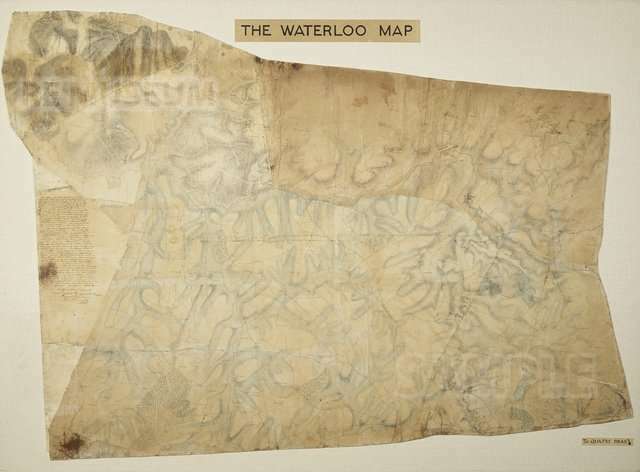 Since this antique map still bears the original pencil markings of the Duke of Wellington, it was housed until 2015 in the Napoleonic Wars section of the Royal Engineers Museum in reduced lighting due to it’s extreme sensitivity. Fig.2 Artratio Display Frame in its transparent state, showing the Waterloo Map at the Royal Engineers Museum, Kent (UK). Inaugurated in June 2015. 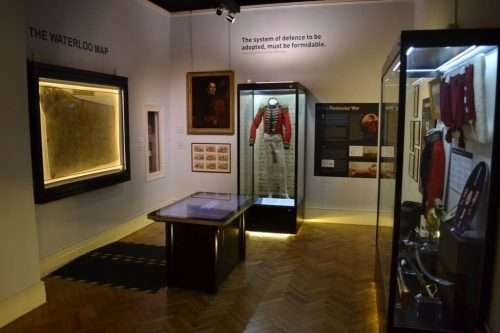 When the Royal Engineers Museum contacted us in early 2013, their desire was to explore how an electro-optic glass vitrine frame could reduce light damage on the object in time for the Bicentenary celebrations of the Battle of Waterloo, held in June 2015. They also mentioned the risk that the graphite pencil markings, being of a friable medium, could be ‘lifted off’ due to any static charge build-up on nearby glass or plastic surfaces, e.g. the front glass facade. 1. Triboelectric effects, i.e. when you rub two materials together, leaving behind excess electrons on one material and removing electrons from the other. Common examples are rubbing glass with silk or rubber with fur. This is called ‘contact-induced charge separation’. 2. Reduced relative humidity within the vitrine frame, since drier air has lower electrical conductivity and hence static charge cannot leak to earth via natural dissipative effects, and so accumulates, potentially resulting in an electrical discharge to the object itself. Static electricity is more of a problem on acrylic products (the most common trade name is ‘Plexiglass’) than on float glass, but can occur on any insulating material with a surface resistivity greater than 10^13 Ohm.metres. Any electrical charge on the surface of an insulator accumulates on it until some mechanism allows it to leak to earth, e.g. an increase in relative humidity or contact with a conductive surface. 1. we earthed the inside of the metallic carcass to ground to dissipate any charge build-up (converting it into a Faraday Cage); this also helped comply with it’s electromagnetic compatibility (EMC). 2. we installed a humidity-control solution in the form of a silica gel cartridge, accessible from the front underside of the carcass to ensure a defined relative humidity inside the vitrine. 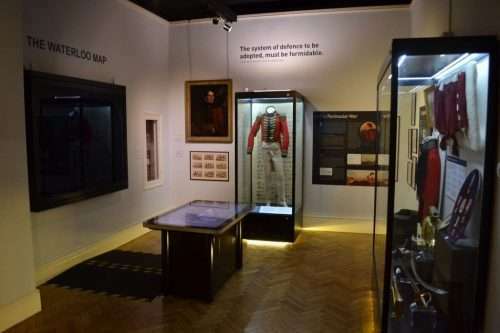 The vitrine measures the temperature, humidity, incident light and light exposure in real-time and historically, publishing the conservation data to the vitrine’s intranet and allowing excursions outside of preset limits to be flagged and actioned by museum personnel. The vitrine cabinet also measures the popularity of the Waterloo Map by counting the seconds that the item is viewed, a useful metric to measure museum visitor engagement. The mechanisms employed will reduce the risk of static charge build-up on any surface that could come into close proximity to the Waterloo Map itself. However, this does not preclude the possibility of someone walking across a carpet (building up static charge in the process) and then touching the Waterloo Map directly (without earthing themselves first on the metallic carcass). It also does not exclude the possibility that someone could rub a piece of silk against the glass facade and bring the Map into close proximity with the glass. These risks are best countered with sensible museum-wide conservation practices. All museums are advised to utilise anti-static cleaning materials on vitrines with glass or plastic parts. These add a conductive layer to the surface, distributing any static charge build-up more evenly and reducing the risk of electrical breakdown, i.e. an electrical spark, which could result in fire. All museums are also advised to put into place best practice processes that mitigate incorrect handling of artefacts that may suffer due to localised static charge (on any insulating surface), as well as controlling the humidity inside display cases, to reduce the risks of static charge ‘lifting off’ friable media on museum artefacts. These measures should ensure a low-risk environment for antique objects such as the 1815 Waterloo Map, so that we can all learn from its history and appreciate the painful events which have shaped the European continent.